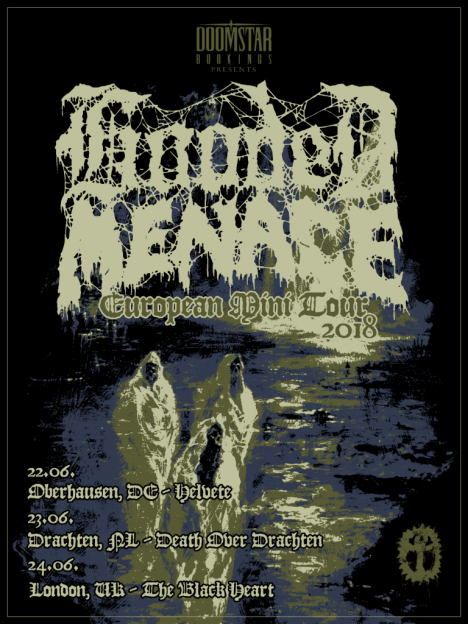 Finland’s death/doom overlords HOODED MENACE have announced a string of European tour dates this summer. The mini tour kicks off on June 22 in Oberhousen, and sees the band playing at Death over Drachten in the Netherlands. A full list of dates can be found below. HOODED MENACE are touring in support of their new album, ‘Ossuarium Silhouettes Unhallowed’. Their most ominous, dark, and mature album to date, ‘Ossuarium Silhouettes Unhallowed’ sees HOODED MENACE expertly weave dreary funereal atmospheres with dark melody, which only adds to emotional gravitas of what is sure to be one of the heaviest albums of 2018. ‘Ossuarium Silhouettes Unhallowed’ is streaming now at Noisey. ‘Ossuarium Silhouettes Unhallowed’, HOODED MENACE’s fifth full-length, is available here.